TechCrunch is two months old today. To celebrate, I thought we’d reveal our RSS Aggregator market share breakdown. Our numbers are much different than those published by Pheedo and Feedburner. The main difference is Pluck has surged way, way ahead – are others seeing this trend as well? Consistent with other RSS aggregator market share reports on the Internet, Pheedo is seeing Bloglines atop our feed reader statistics, followed by Firefox, Thunderbird, NewsGator and Sharpreader. 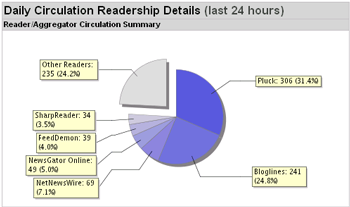 In aggregate, these readers are used by almost 70 percent of people subscribing to Pheedo managed RSS content. Pluck is clearly the no. 1 aggregator for TechCrunch readers. Are other bloggers seeing this surge by Pluck?